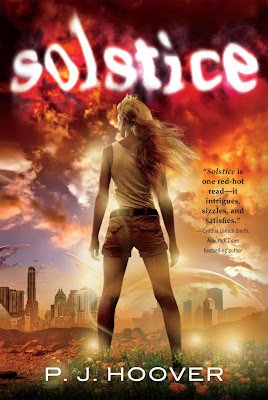 I am thrilled to share the cover for Solstice by my good friend P.J. Hoover! She is another shining example of why Texas writers rock! I read Solstice and just loved it! I find mind myself recommending it in the library to girls who love mythology then I have to remember that it isn't even out yet. Zoinks! The cover is exactly what this book is about, and the blurb for Texas' own Cynthia Leitich Smith sums it up: “Solstice is one red-hot read—it intrigues, sizzles, and satisfies.” Bookmark this one and set your sights on one hot read in June 2013! Congrats, P.J. !